Brickhouse Security’s Micro Bluetooth Earpiece is so small it actually fits inside the ear canal to allow covert two-way communication via any Bluetooth mobile phone or two-way radio. Its size means that a battery is out of the question, so the tiny device is powered by magnetism, which is also used to remove the earpiece from the ear canal.The earpiece, which is actually a strong passive magnet, receives the audio signal via vibration from an induction-type neck loop transmitter draped over the user’s shoulders. Working on a vibration principle not only allows for the unit’s small size by doing away with the need for a battery, but also means it has no open sound cavity. 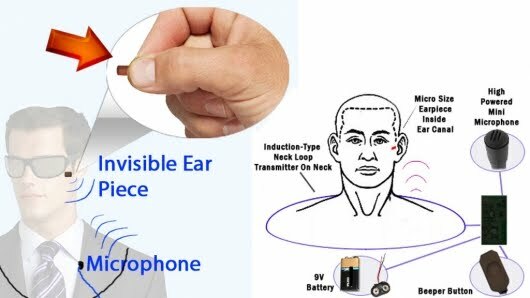 Four sizes of magnetic earpiece are included ranging from extra small for pixie-esque ears to Michael Phelps large.The earpiece also comes with a microphone, which can be concealed under clothing, where Brickhouse claims it is still able to pick up the faintest sounds. Meanwhile, for those occasions when you can’t talk there’s the silent SOS Button. The button is attached to a wire that is long enough to run down a pant leg and allow the button to be placed underneath your toe or hidden inside a pocket.Upon pressing the beeper button, a beep tone is sent to your associates over the phone, no matter where they are in the world. The covert SOS button could be used to signal one click for yes, two clicks for no. Any spy worth their salt, however, will be able to get more advanced with full fledged SOS beep communication, without anyone thinking they have anything more than a nervous tic.The microphone, beeper button and neck loop transmitter are all connected to a Bluetooth Board - a PCB board small enough to fit in a pocket that is powered by a 9V battery.The device was originally designed for the Secret Service but is now available to the general public. Some possible uses suggested by Brickhouse include on-camera journalists, actors and actresses who need to be fed lines, and modern day Cyranos looking for some instant feedback on their first date performance. Unfortunately use while gambling or during tests is advised against. There’s either been a shortage of Brickhouse Security Invisible Bluetooth earpieces rolling off the production line, or there are a lot more spies getting about than I had realized – which I guess would make them good at their job. The earpiece, which is currently out of stock until January 2010 due to “overwhelming demand,” usually retails for US$300, but is currently available for pre-order at $219.95.